Mr. Arman Mulleem is the Executive Vice President of the Worldwide Filipino Alliance (WFA), a worldwide alliance of Filipinos around the world. 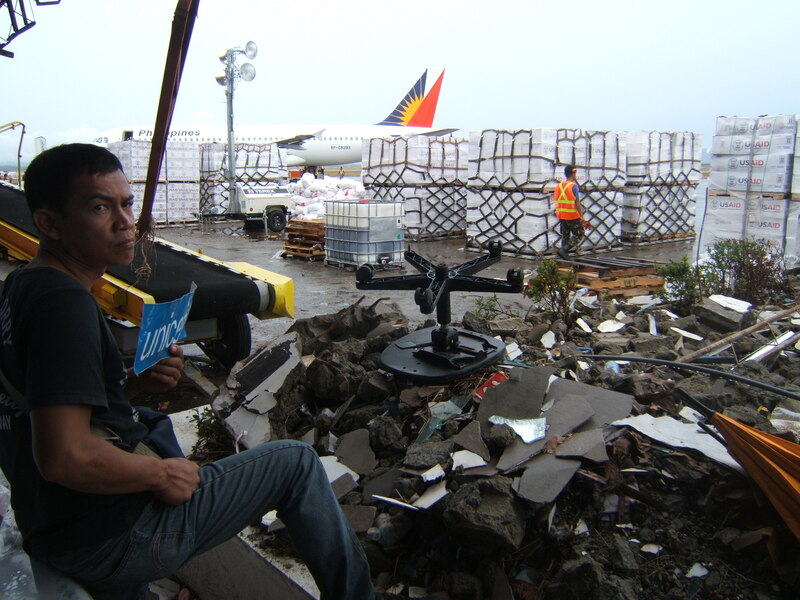 In November 2013, Arman recently returned from his work stint in Saudi Arabia, joined Evelyn Castillo of the Bayanihan Foundation Worldwide in visiting Leyte and Samar, two weeks after the devastating typhoon Haiyan hit landfall. Arman shares his personal experience and first hand account visiting the Philippines right after typhoon Haiyan. My name is Arman Mulleem. I consider myself a “do-gooder” par excellence. I have lived and working in Saudi Arabia for many years as an overseas worker. I also have been very active with the Worldwide Filipino Alliance (WFA), a worldwide alliance of Filipinos around the world that promotes and supports Filipinos in the diaspora. When Evelyn Castillo of the Bayanihan Foundation Worldwide invited me to join the foundation’s efforts in providing emergency food relief, I did not think twice and booked my ticket to Tacloban, Leyte to help. From the air looking out of the window of my Philippine Airlines Express flight, Tacloban Airport (or what used to be) looked more like a picture of a bombed-out structure from an old World War II movie. As I walked from the plan towards the arrivals area, the sense of gloom was unmistakable. A couple of US Air Force C-130 planes have just unloaded tons of US-AID marked crates, while another cargo plane from Australia was waiting for its turn to unload its cargo. At the baggage claim area, airport and military personnel deserved commendation for maintaining order in an otherwise primitive situation when everything had to be done without any working machines and technological support. Dale Asis, Executive Director of the Bayanihan Foundation, Evelyn Castillo and Ana Hastreiter, a volunteer from Munich, Germany were already waiting for me in the parking area. Less than a kilometer from the airport, our nostrils were greeted by a kind of stench that defies the description. A few body bags have yet to be picked up besides the mounds of debris but we think the offensive odor came from the human and animal remains underneath the piles of concrete, steel, wood and garbage that the Philippine Department of Public Works working round the clock – have yet to clear up. 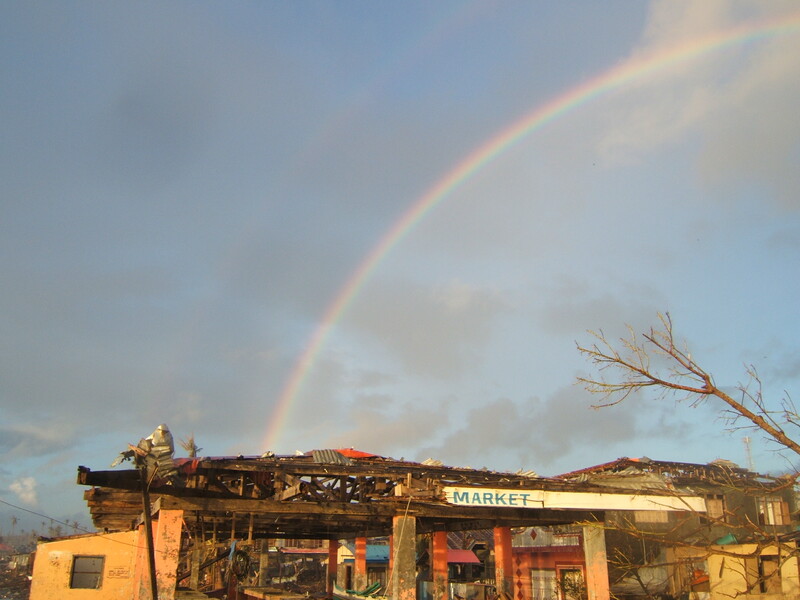 It seemed like that Tacloban looked like a bigger version of a garbage dump site and the residents almost seemed immune to the permeating stench that the people just ignored. As we exit the city and head towards the island of Samar, I saw the San Juanico Bridge, an engineering marvel. 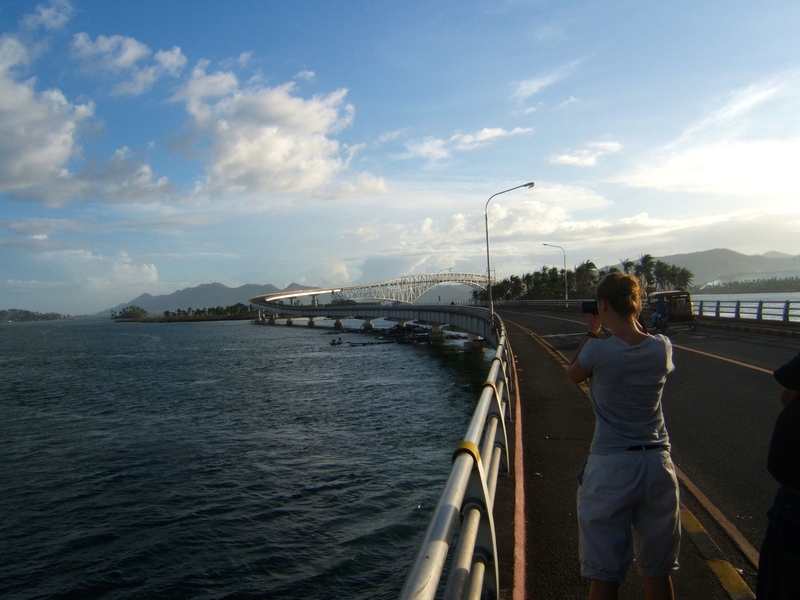 The bridge was hardly damaged, a welcome relief from the unimaginable destruction that was Tacloban City. However, immediately after crossing the bridge, we were back to reality. 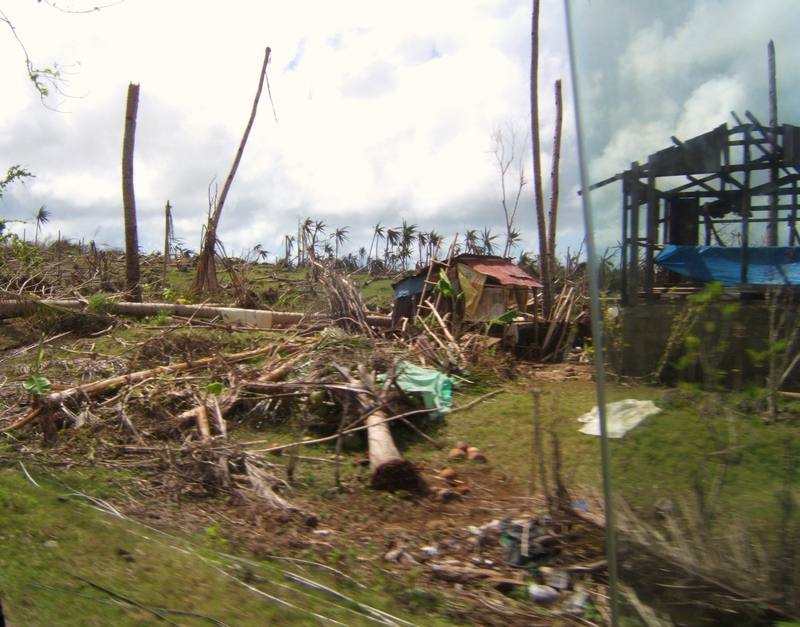 Coconut trees were uprooted; houses and buildings were without roofs and walls; many were toppled to the ground while others were simply blown away – Devastation with a big “D”. It was almost dusk when we reached Giporlos, Eastern Samar. 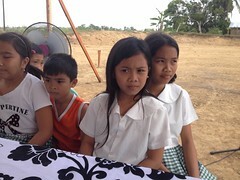 The volunteer doctors of the Medical Action Group were already there and Evelyn’s nephews and nieces welcomed us all. We started sorting the medicines and supplies we brought but by 10 pm the electric generator ran out of fuel and so we just called it a day. Except for Dale who slept soundly, the rest of the group remained listless all night. I think we were kept awake by the images of massive destruction that we saw. The next morning, a beautiful rainbow greeted us. Even sound sleeper Dale was ecstatic at the sight of the rainbow and immediately took pictures. Dale was also the first to visit the washed-up fishing pier where fishermen unloaded their catch to be sold in the nearby fish market. Taking a short stroll from the pier, I walked toward the municipal hall. I saw the twisted metal of the former municipal grand stand. The hall’s windows were broken; it was a shamble of steel and concrete. A giant tree fell on the fire station’s building and ambulance parked beside it was damaged beyond repair. 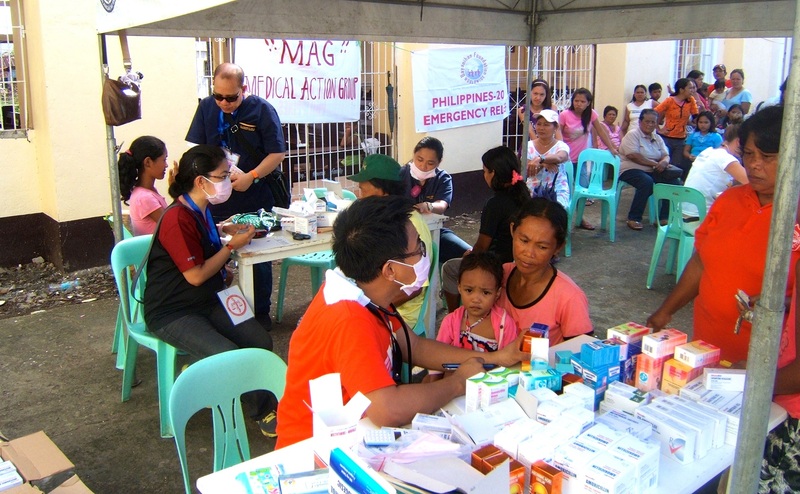 Right after breakfast, we conducted the medical mission with volunteer medical staff from the Medical Action Group (MAG). 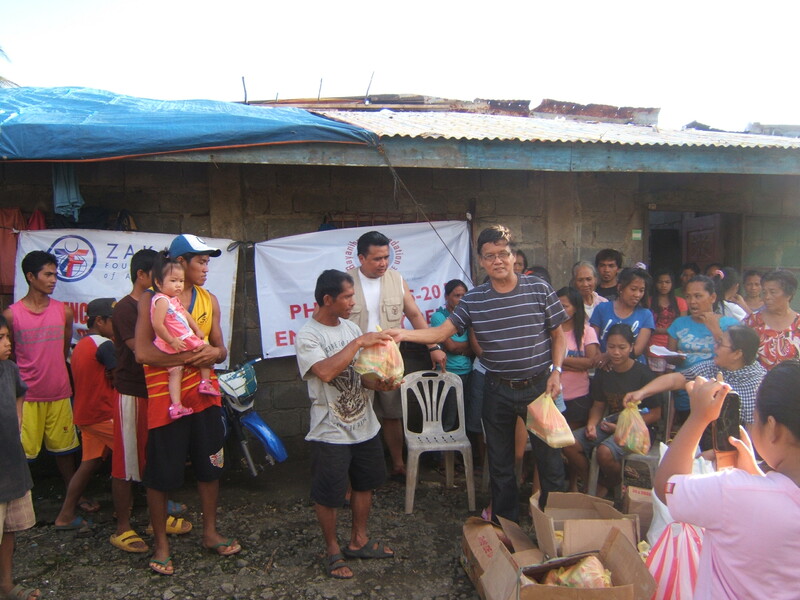 We conducted the medical mission in front of the parish priest’s residence besides the Catholic church. At the same time, a team of medical staff from the Philippine Dept. of Health also helped us along the way. The volunteers worked non-stop with nary a break. After treating the last of some 300 patients, the group packed up. Hungry and tired but happy for being able to help and serve. The group finally decided to have lunch at 4 pm that afternoon. We just stretched our legs and relaxed for an hour and the group was ready to go to the next mission in the next town, Guian, the town where the super typhoon Haiyan first hit landfall. On my second day, Evelyn conducted a meeting with local fisherfolk from nearby villages near Giporlos and Guian, Samar. She presided the meeting in the native language, Waray, interspersed with English for the benefit of us who did not understand the dialect. She gave me the floor to explain my proposal for the Worldwide Filipino Alliance (WFA). Using the boat-for-livelihood as an example, I explained to them how my colleagues from WFA intend to help their respective barangays (villages), putting emphasis on the fact that we cannot help them all at the same time, and that the assistance will not be handout but a ‘soft’ loan with a small interest. The idea was to imbue the fisher folk with a sense of responsibility. Those from the coastal barangays were receptive to the idea, while those from the hills whose main source of income was from coconut farming have some reservations. There is a tremendous need for massive replanting of fast growing coconuts. But even the fastest growing coconut varieties will take years to bear fruit. 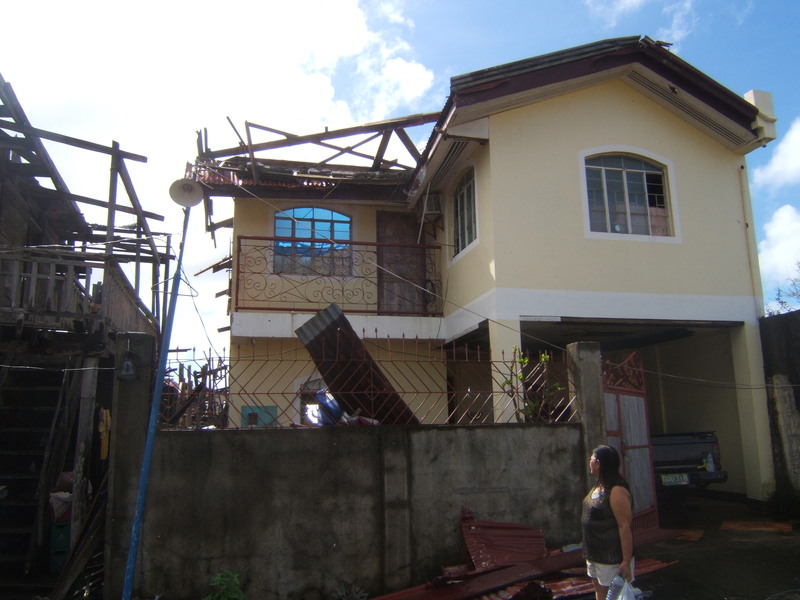 Farmers and fishermen were not the only ones adversely affected by the typhoon. Craftsmen and artisans whose main source of income depended on electric power were also severely affected. There was no electricity the entire time we were in Samar and they’re predicting months before electric power will be restored. On my third day, I visited Evelyn Castillo’s devastated home. Roofless and windowless, i would need major repair before it becomes livable again. She told Dale and me that the strong winds lifted her refrigerator and her air conditioner from the second floor of her home and landed about 50 meters away. “I would take my chances,” I insisted. On my fourth and last day, the morning air was cold and heavy rain clouds were threatening in the horizon. 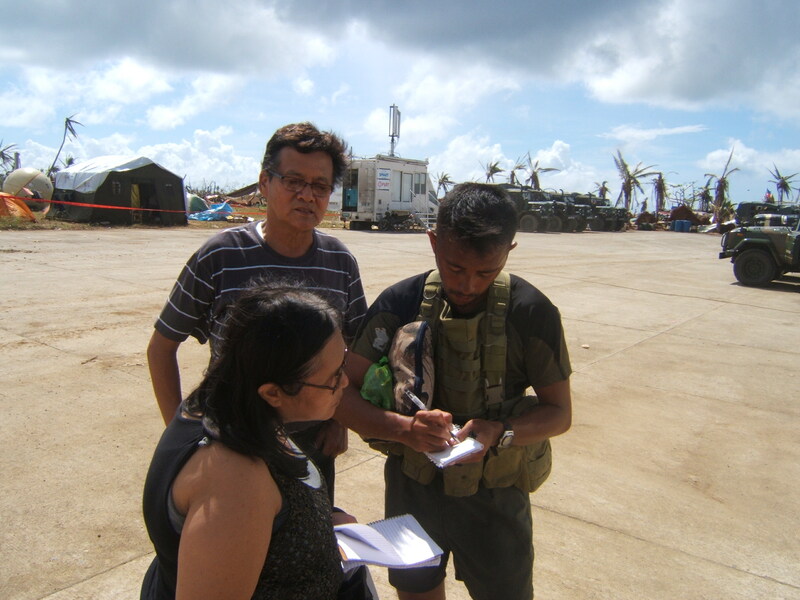 By 7 am, the queue to join the Philippine c-130 cargo plan was already long but still I managed to sign the logbook. A half hour later, the much awaited Philippine c-130 cargo plan arrived and one hour later we arrived at the Philippine Villamor Air Base. We were driven to the military grandstand where volunteers were saluted and given a warm welcome by the military. They even provided us a warm lunch of rice, chicken adobo (Filipino curry) and sautéed string beans. One of the military volunteers asked me how I survived the typhoon. I told her that I was not a survivor but I was a volunteer helping out in a mission with the Bayanihan Foundation and the Medical Action Group (MAG). She was impressed by my volunteer spirit and she promised me to treat me to a nice lunch or dinner for my volunteer efforts. This entry was posted in Diaspora Donors, Diaspora Giving, Disaster Relief, Environmental conservation, Philippine poverty, Philippines, Typhoon Haiyan, Volunteerism and tagged community involvement, diaspora giving, diaspora philanthropy, disaster relief, Philippine poverty, typhoon Haiyan. Bookmark the permalink.